I mentioned the passing of our amazing Bea Grow a while ago. Her death last December was sad, but now comes the truly unbelievable news that her garden is to be dismantled bit by little bit. I was as shocked as I imagine most of my fellow gardeners were when I read the craigslist notice of the sale of the contents of her house and garden that my friend sent me. Disposing of the house contents I can understand, but taking apart the garden? Say it isn’t so! This is a beautiful and amazing space. 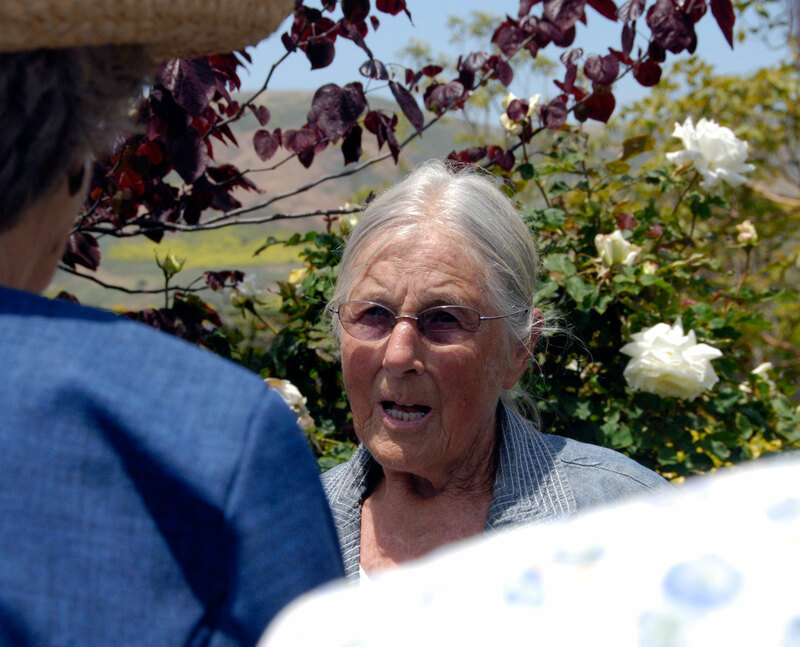 Bea was a true master of her craft and the garden she created on a hot, Southern California hillside was a joy to see. 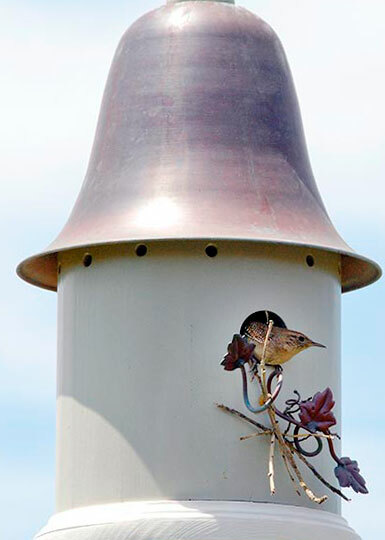 There are surprises and delights wherever you look — an adorable beehive watering can nestled amongst the greenery, graceful fountains and pedestals, a bird house with Bea’s little wren friend flitting in and out, delicious color combinations, and, amazingly, a rhododendron. 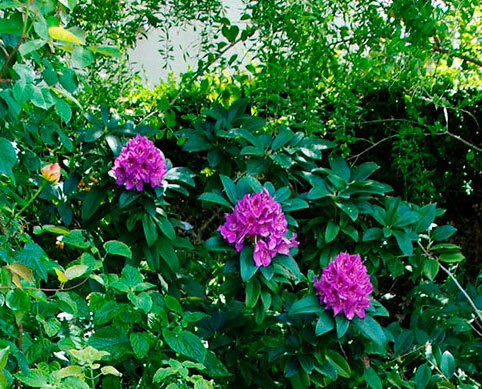 Who but Bea could grow a rhododendron in San Clemente?! Bea was very generous about showing her garden and with gardening advice. You could ask her anything and she would tell you her formula. 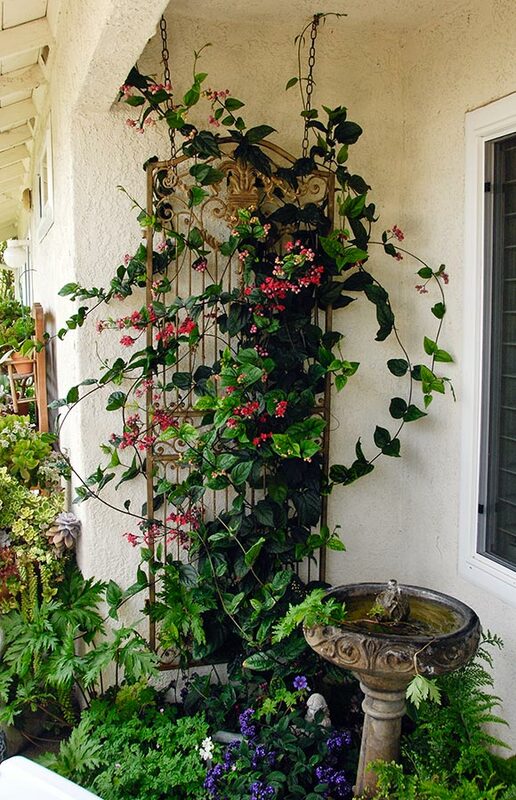 I was pleased to hear that she credited watering with a weak solution of fish emulsion (one of our favorite techniques) for her success with containers plantings. And it wasn’t just the garden that was beautiful. Bea was as lovely and gracious a person as you could ever meet. She was kind, funny and humble. The day I visited I asked if I could take her picture. She said yes, but she didn’t think I really wanted to do that. She told me she wasn’t a very good subject as she was very plain-looking. On the contrary, I told her, and I meant it. See for yourself. Not conventionally beautiful perhaps, but beautiful nonetheless; Bea was as lovely looking as any flower in her garden. Bea (3rd from left) sharing her gardening tips. I haven’t been able to stop thinking about Bea and her garden since I heard the news. The sale of the contents of her garden seems so wanton and disrespectful of a life’s work. Surely there’s some gardener out there who would love to buy Bea’s house and put his or her touch on this jewel. I know all about change and impermanence and have meditated on this concept often. But this week I am struggling with it. Sometimes it’s just too soon. And, no, I’m not going to the sale. As much as I’d love to have a small piece of Bea’s garden to put in mine, I don’t think I can bear to see the destruction of her work. The memory will be enough. What a beautiful garden Bea created. I hope whoever buys her house keeps the tradition. Oh this is such sad sad news. I have never heard of garden contents being sold. To have such a lovely garden destroyed for the sake of a few pennies is so thoughtless and greedy sounding. I am so glad you were able to enjoy her lovely lovely garden. Maybe a few of you could stand outside the house with signs and protest! So, so sad. That the amount of time and sweat and wisdom and love and creative energy that she put into her garden is not valued at all. It’s a small version of some of the larger problems in the world today. I, too pray that some new plant lover can take it over and at least benefit from the many years of care of the soil. Bea was a wonderful, interesting, and gentle soul. 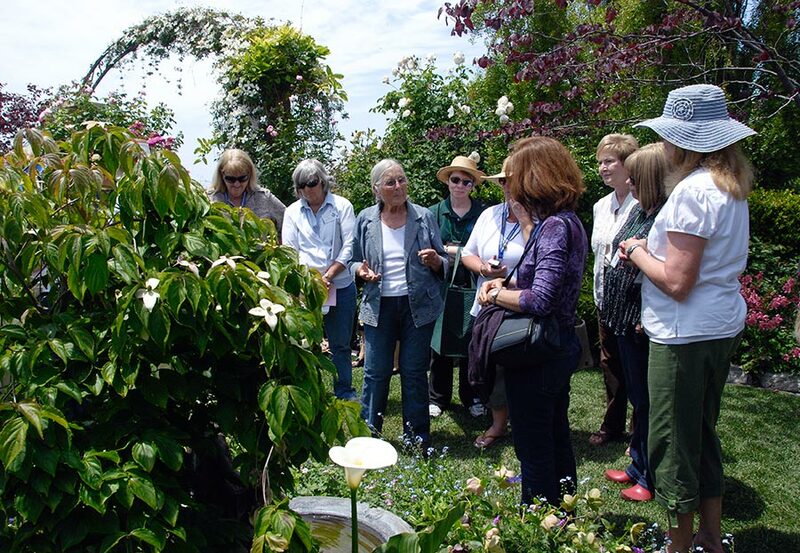 I’ll never forget the first time I went to her home for a tour of her garden. 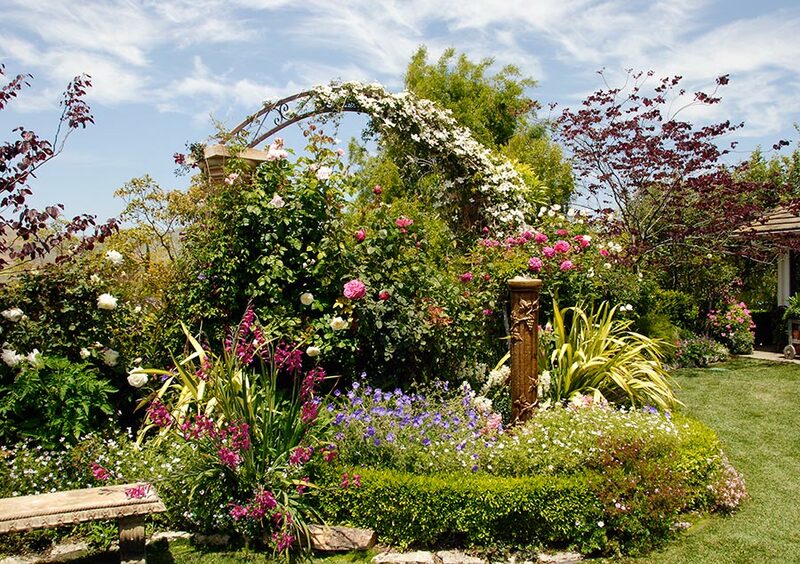 I could not believe how picture perfect and interesting her backyard gardens were—definitely not designed by a schooltaught professional as it was overflowing with flowers, arbors, secret private gardens with sitting areas, etc, all on a relatively non-descript street. It looked like an overflowing, exuberant version of a Thomas Kinkade painting—though more floral and romanticized. It was a huge amount of detail to maintain—-which she said she took care of herself. Months after her passing I did hear that she actually had 3 gardeners doing all of the detail work. I’ll forgive her for her slight omission as I’m sure she actually did all of the work for decades prior to her reaching a mature ago. Bea was a special person who is missed by many and will continue to be thought of with warmth and love for decades after her passing! My wife, an avid gardener, and I bought Bea’s wonderful home. 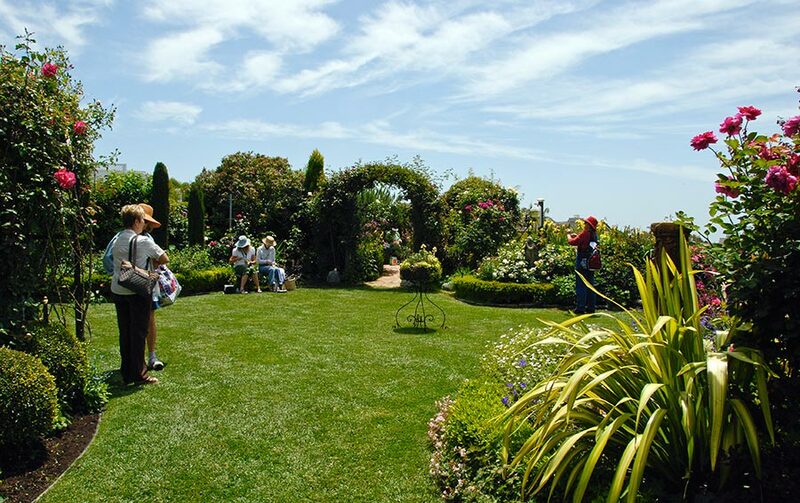 We were also disturbed by some of estate sale, but want you to know that the garden remains entirely intact. Everything we do we do with what we hope Bea would like. Nothing has changed but the seasons. 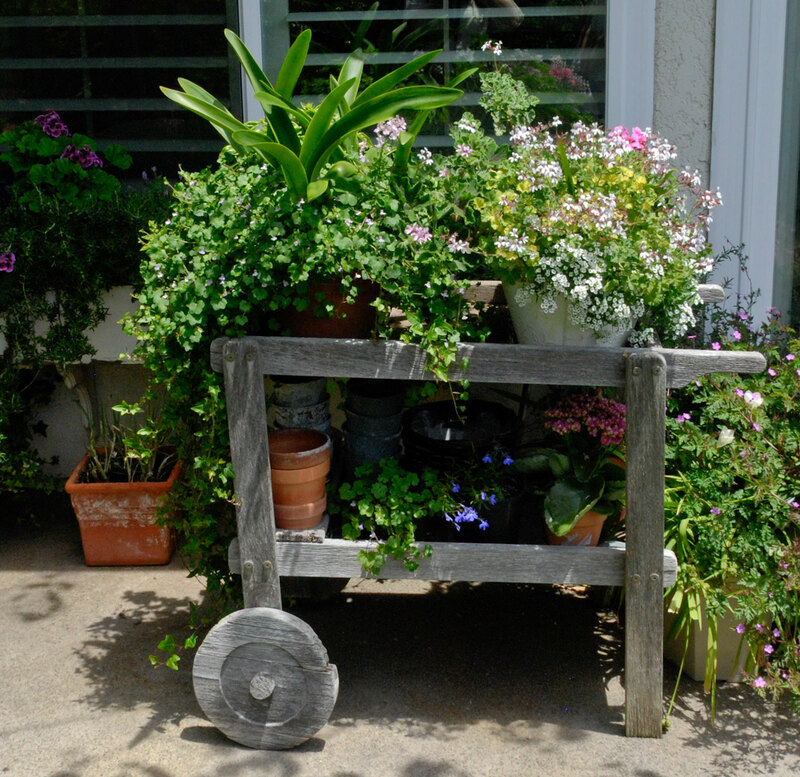 Many potted plants sold, buy garden intact, and lovely. We are looking forward to our first Spring in garden. By the way, every day seems to bring a new flowery surprise to our lives. Bea a horticultural genius. Ps come on by, or we can send photos when Spring in full gear. Tom, Regarding a visit to your garden: If you and your wife would like to schedule a convenient day in April that I could visit when things are blooming all over, please let me know. I’d very much appreciate another chance to see the next chapter in your garden. Thanks! April sounds great. The garden should be exploding by then. I’ll get with my wife and post a date for a visit. I know this post is old but I was missing my grandma and googled her name. I was raised in that house and I’m happy to know that someone who loves her garden like I did lives there now.